A modern computer system that is not part of a network is an anomaly. But managing a network and getting it to perform well can be a problem. This book describes two tools that are absolutely essential to distributed computing environments: the Network Filesystem (NFS) and the Network Information System (formerly called the "yellow pages" or YP).The Network Filesystem, developed by Sun Microsystems, is fundamental to most UNIX networks. It allows systems ranging from PCs running DOS to UNIX workstations to large mainframes to access each other's files transparently. It is the standard method for sharing files between different computer systems.As popular as NFS is, it is a "black box" for most users and administrators. This book provides a comprehensive discussion of how to plan, set up, and debug an NFS network. It is the only book we're aware of that discusses NFS and network performance tuning. 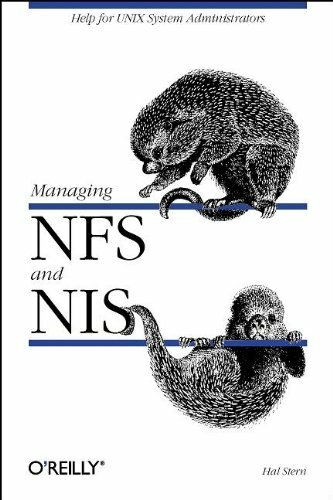 This book also covers the NFS automounter, network security issues, diskless workstations, and PC/NFS.NFS isn't really complete without its companion, NIS. NIS provides a distributed database service for managing the most important administrative files, such as the passwd file and the hosts file. NIS centralizes administration of commonly replicated files, letting you make a single change to the database rather than making changes on every system on the network.This book tells you how to set up and use NIS to simplify network management. It also tells you how to use NIS to manage your own database applications, ranging from a simple telephone list to controlling access to network services.If you are managing a network of UNIX systems, or are thinking of setting up a UNIX network, you can't afford to overlook this book.